If there is anything to capture the imagination of the reading public, it is a book about books. Throw in a little magic and you have a very good chance of enchanting the many not the few. Bridget Collins is onto a good thing with her first novel aimed, ostensibly, at adults, then. The Binding’s high concept is pretty simple: what if one could have unpleasant or painful experiences expunged from one’s memory by visiting a binder, who would, for a small fee, bind a book containing the chosen episode and thus eradicate it from one’s own memory? Think Eternal Sunshine of the Spotless Mind but set in old-time England. Emmett Farmer, like most young people in Collins’s world, has long been warned off books. The bindings that do the rounds are looked at with fear as some strange and unknowable magic, each one representing a dark secret excised from a stranger’s life. And yet, even as he works on his father’s farm, Emmett has a strange fascination with books. In time, he will discover that he has a gift for binding, and will be taken in as apprentice to elderly binder Seredith, who is viewed with suspicion by the community. Seredith upholds the noble art of binding and will not cheapen her profession by selling books on the black market or producing forgeries (known as ‘novels’) to titillate less scrupulous members of society. Not all binders are as conscientious as Seredith, as Emmett will discover. When he moves to a new bindery, he finds an operation that assists wealthy clients in wiping the memory of servants and other lowly characters who they have wronged, allowing them to repeat their crimes afresh. He realises, too, that there is a lot of money to be made from selling books to said wealthy clients that they might vicariously enjoy the misdemeanours of others as well as their own. Emmett is still in his infancy as a binder when he meets the son of one of the wealthy clients who regularly sends servants to be bound. Lucian Darnay is an effete, foppish young man who appears to take an instant and inexplicable dislike to Emmett. However, in a world where memory cannot be relied upon to tell one’s story, there is no knowing whether Emmett and Lucian have a history. Indeed, we quite quickly learn that Lucian was once engaged to Emmett’s younger sister, Alta, and so, it appears, there is something to be told. Unlike Eternal Sunshine of the Spotless Mind, The Binding doesn’t dwell on whether, if one could, it would be right erase displeasurable memories from one’s mind. The majority of bindings in the story are either forced upon people by others who wish them to forget, or by those unfortunates who sell their stories for a few pennies to make ends meet. Instead, the focus here is on the consequence of bindings for those who have undergone them and the very personal story of Emmett and, later, Lucian. 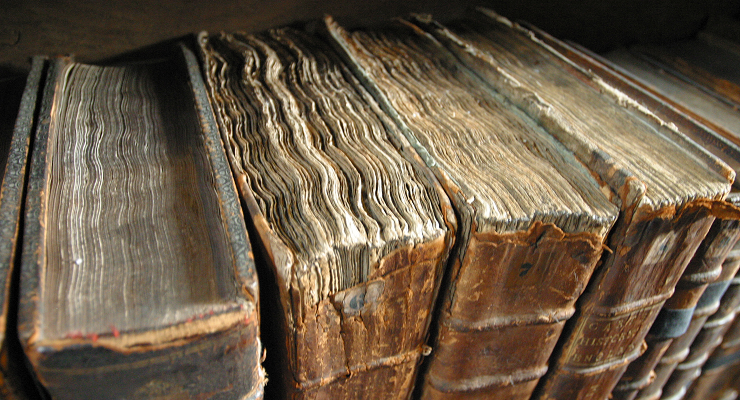 Indeed, the deeper into the book one gets, the less the art of binding matters beyond being a dramatic device. High concept novels work best when they weave in a believable, powerful personal story but I am not wholly convinced here that Collins has done as much as she might have with her premise. I had expected some tussle for the future of the profession, something akin to the wonderful Jonathan Strange and Mr Norrell, where magic was the art for which different folks (each with different viewpoints) were fighting. Personally, it was the idea of binding that made me pick up this book and consequently, I came away a little disappointed on that side of things. 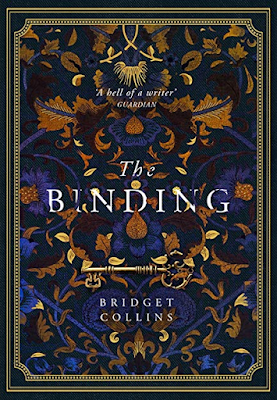 But if The Binding isn’t all about, well, binding, what of the story it does tell? The further into the book one gets, the further it transforms into a YA-level romance. There is some sweetness to this but there is a lot of clangingly sentimental or cringe-inducing dialogue too. Fictional relationships that lack the complexity of real-life are not really my cup of tea but I rolled along with this one as the twists and turns of youthful lust unfurled. Its execution was fairly convincing but I can’t say I was at any point truly engaged by the key relationships of the story. The romance does give an opportunity for Collins to bring in some commentary on class issues (and the rural-urban dichotomy) - the Darnays (father and son) both exhibit some rather distasteful behaviour towards those considered ‘beneath them’. When Nick Carraway writes of Tom and Daisy Buchanan in The Great Gatsby, “they smashed up things and creatures and then retreated back into their money and vast carelessness,” he could easily have been observing Lucian and his father. Unsurprisingly, in a novel set several centuries back and where class is important, women fair badly. Whether they are being demonised as binders, abused as staff, or thwarted in affairs of the heart, being a female in Collins’s world isn’t easy. Still, they can always have their memories wiped, ready for fresh mistreatment (lucky things). And so the act of forgetting – or looking the other way – is even easier: not only does no one want to listen, there is nothing left to tell. A great deal of mining the premise does seem to be down to the reader so even the interesting elements of knowing/forgetting are left underdeveloped. On the positive side, there are some nice descriptions of nature and the first section has glimpses of the magical story this could have been. To me, The Binding has the feel of a fairly pedestrian YA-romance infused with one excellent idea, which is never fully capitalised upon. For all the promise of the premise and the beautiful design of the book, this cannot but be a disappointment: a pleasant enough diversion but ultimately unsatisfying.